A couple of weekends ago I went to Prince’s Island Park for a performance of The Tempest by local theatre group, Shakespeare by the Bow. The group is made up of up-and-coming artists who are mentored by members of Theatre Calgary. Each performance is pay-what-you-will and is a really lovely way to spend a summer’s afternoon. I went with friends and we settled on the grass for a picnic and a show and tried to stay cool under the blazing Calgary summer sun. 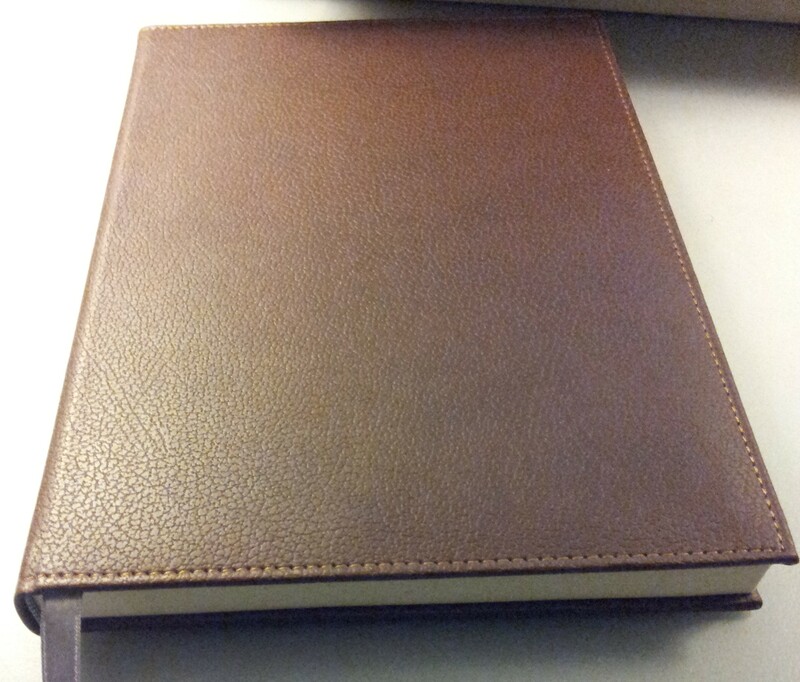 In addition to blankets, fruit and water, I brought a special notebook with me, one I have mentioned on this blog a couple of times. 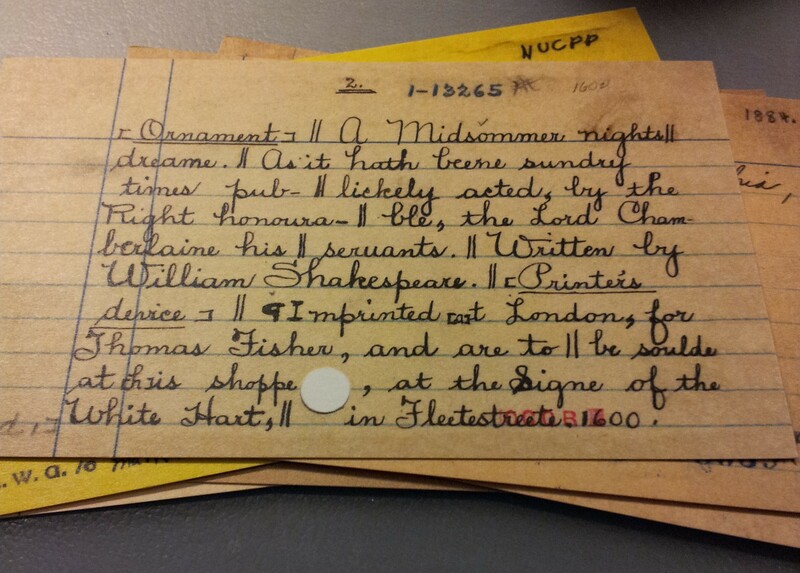 In this post from June of 2012 I wrote of my search for the Paperblanks William Shakespeare journal and my enjoyment of that years’s production, A Midsummer Night’s Dream (they were called Shakespeare in the Park at that time). 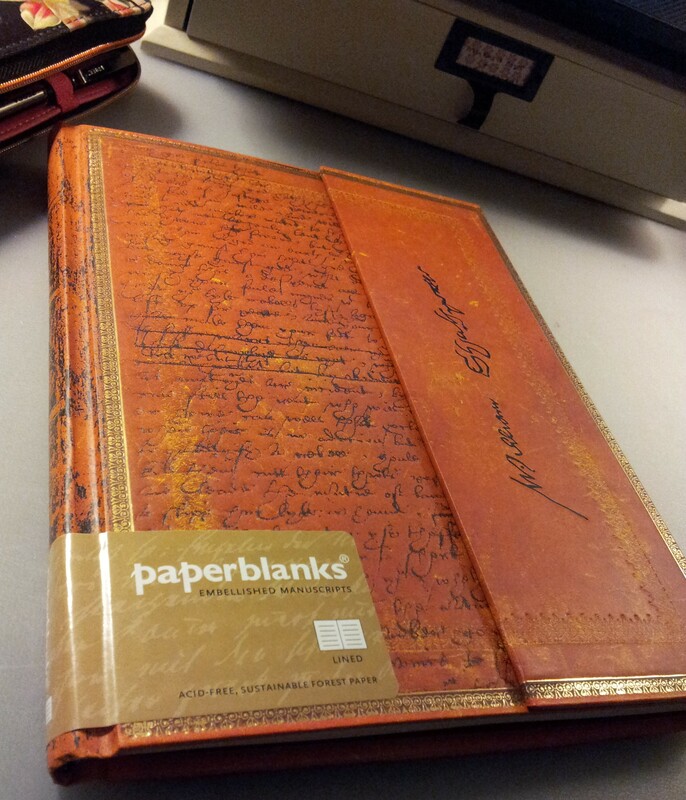 And then in March of this year, in this post, I wrote about finding the Paperblanks Shakespeare journal at Reid’s and how in love I was with it. 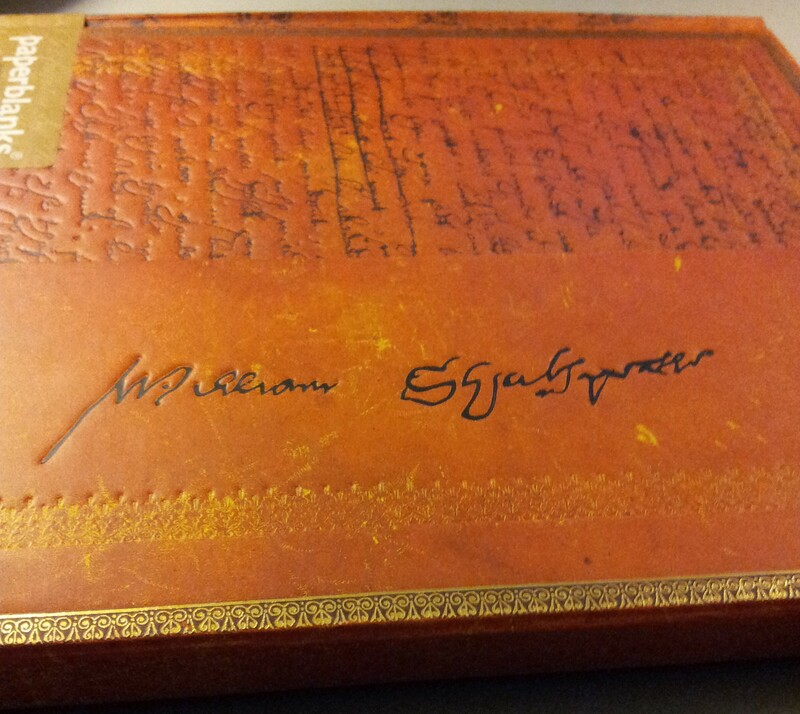 So it was more than fitting to bring my Shakespeare journal with me to watch this year’s performance of The Tempest. I realize I should have taken a picture of it “in the wild” as it were but it was so hot that day I was worried my phone would melt. 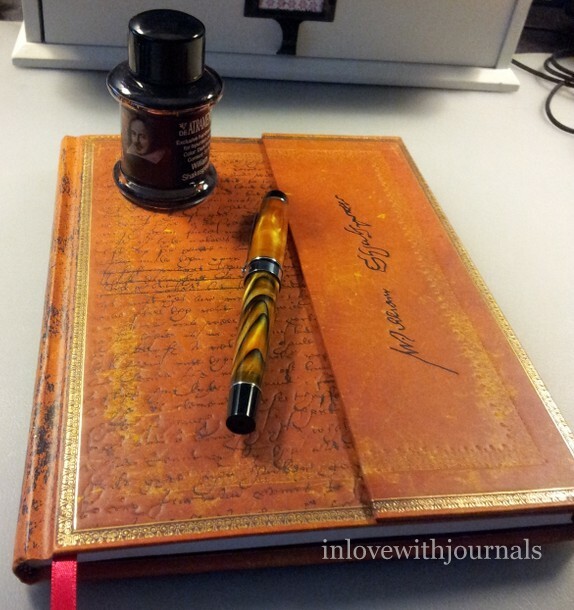 I paired my De Atramentis William Shakespare ink with my Tiger Eye Monteverde pen and I think the combination is just stunning. 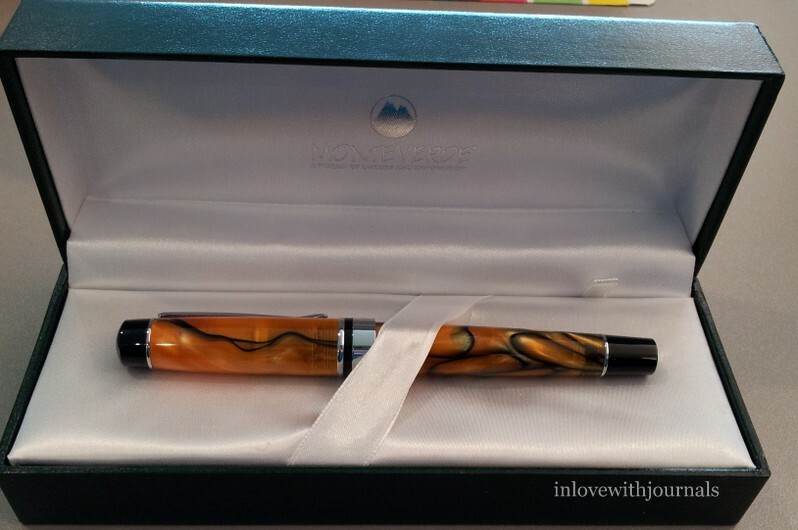 I talked about this ink in 2014 in this post. Sorry for the lateness in my posting of late; I’ve been having technical difficulties with my laptop. 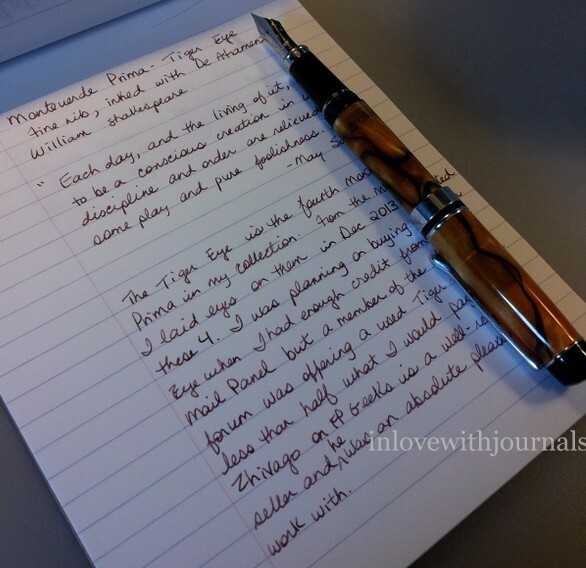 All seems to be working at the moment, so let’s talk about Monteverde Prima in Tiger Eye. 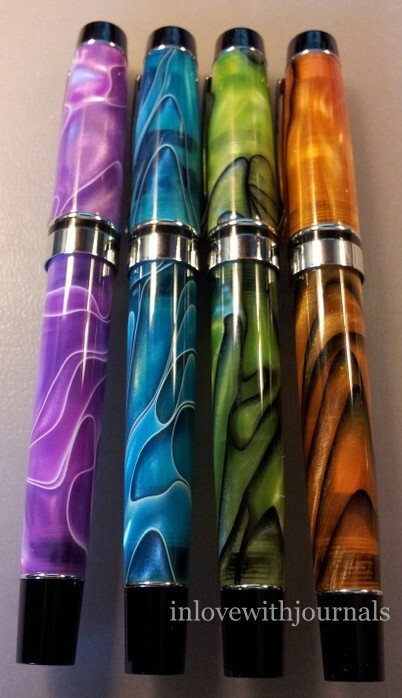 I have been wanting this one to complement my three other Monteverde Primas: Green Swirl, Purple Swirl and Turquoise Swirl. I started collecting these in December 2013 and I would wholeheartedly recommend them. 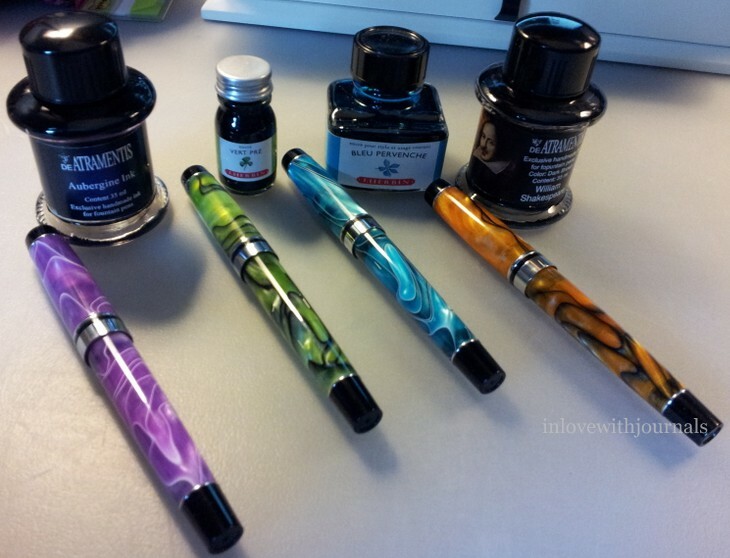 Good writers with smooth lines, no skipping or hard starts, as long as you use the converter that comes with the pen. More on that later. I saw an ad on FP Geeks posted by Zhivago for this beauty. The advertised price was less than half of what I would pay for a new one. He was wonderful to work with, and actually refunded some of my shipping cost because the postage was less than he had thought. It arrived within a couple of weeks and I am thrilled with it. I have seen many different examples of the Tiger Eye finish. This is a wonderful blend of orange and brown. 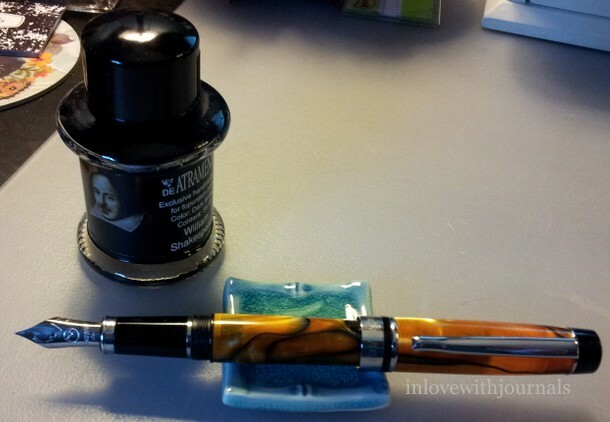 It has a fine nib, which is different from the two medium and 1.1 stub nibs of my other Primas. Here’s a close-up of the nib. 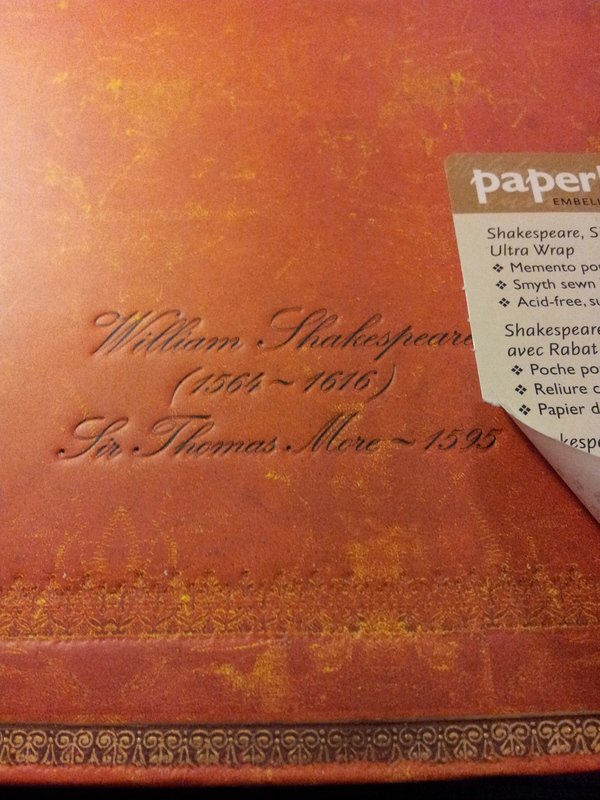 I have it inked with De Atramentis William Shakespeare. And here are all four! I think they look stunning together. I find it interesting that the Purple has a white line, the Turquoise has white with a bit of black shading, and the green and Tiger Eye have black. Here’s a writing sample. 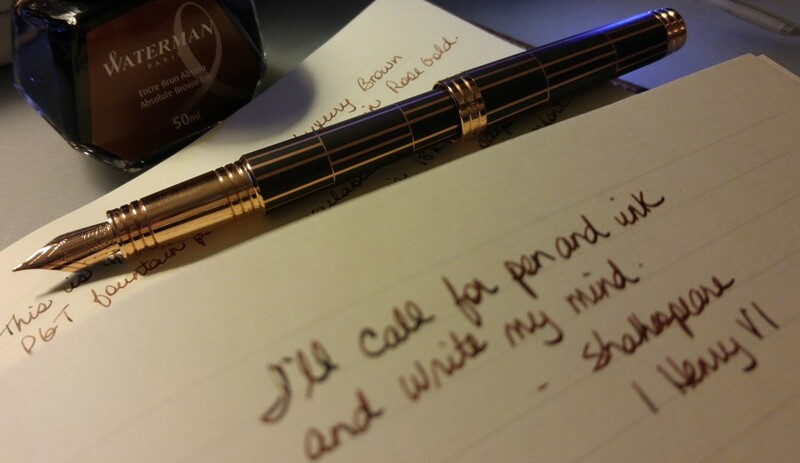 This fine nib is super smooth and a pleasure to write with. The line is not dramatically different from the mediums, in contrast with the 1.1 stub. The stub really stands out. According to Goulet Pens website there is a broad nib available, which I may purchase at a later date, as all of the nibs are interchangeable. While doing this review I was having trouble getting the Green to write. I know I just said what wonderful writers they are, so bear with me. I had switched from Private Reserve Avacado (sic) to a Faber Castell cartridge in Moss Green. No matter what I did I couldn’t get the darn thing to write. So I tossed the cartridge and filled the converter with J. Herbin Vert Pre. 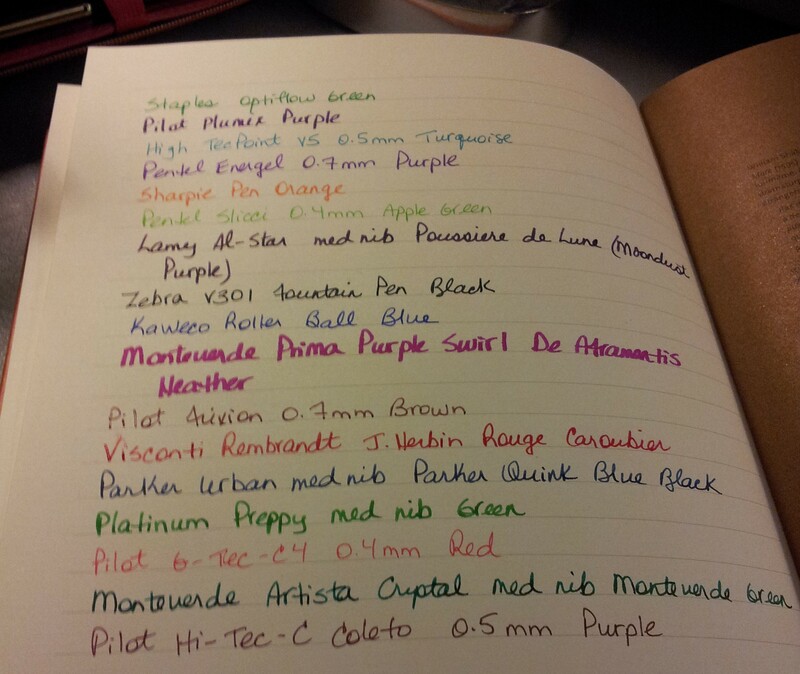 My first time using that ink and wow what a colour. Great match for the barrel too. 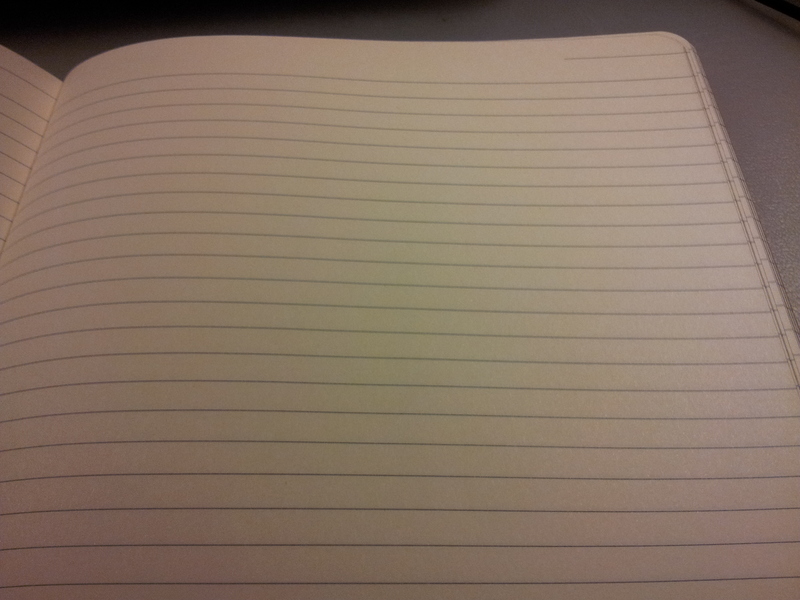 And the pen wrote perfectly, first try. All of my other Primas have converters in them right now too. So that’s why I think this particular model prefers a converter to a cartridge. Just my experience; yours may differ. If you have readers or writers on your Christmas list then The Literary Gift Company is a good place to start. They have a multitude of different literary gifts, at various price points. 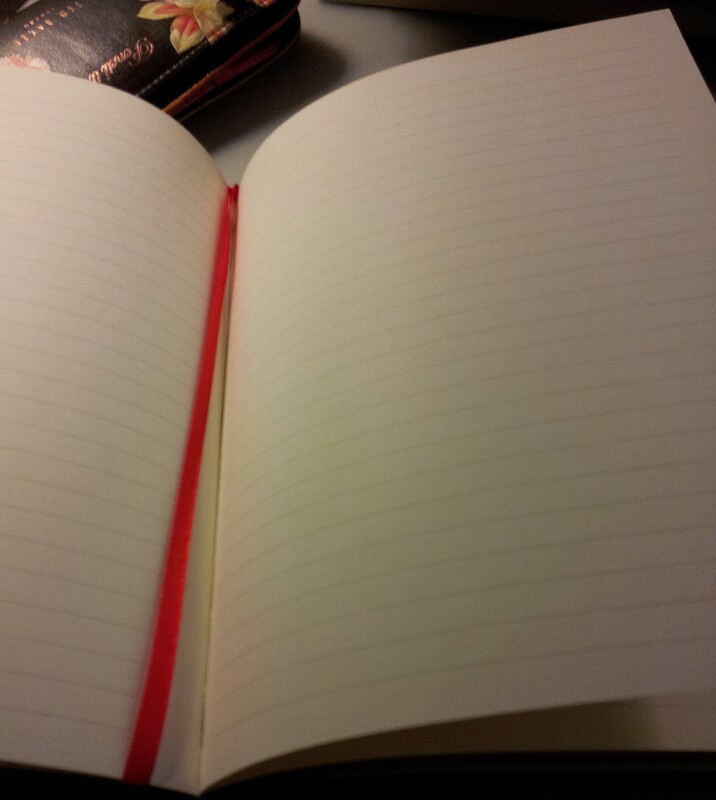 Clothing, diaries, jewellery, journals, stationery and home decor, just to name a few categories. The team behind the website is super friendly and the shipping is fast and super reasonable. I placed an order and it arrived in 6 days. 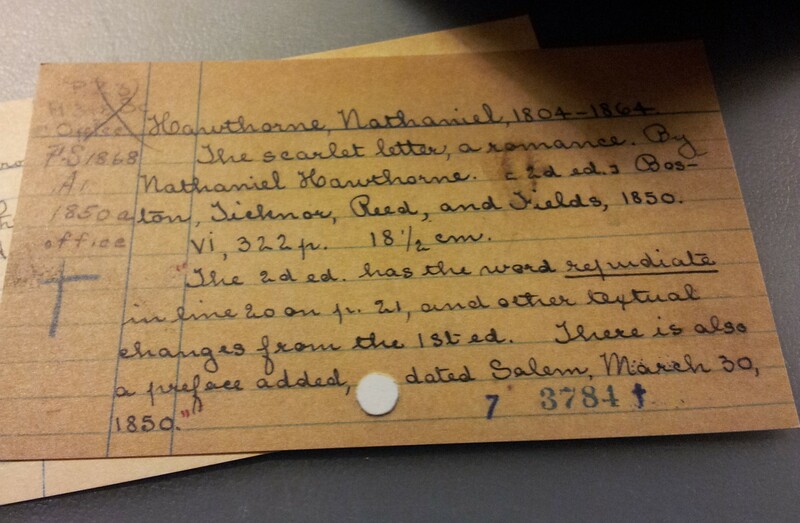 I bought some Christmas gifts so I can only share the one item from the order I bought for myself: The Card Catalog: 30 Notecards from the Library of Congress. 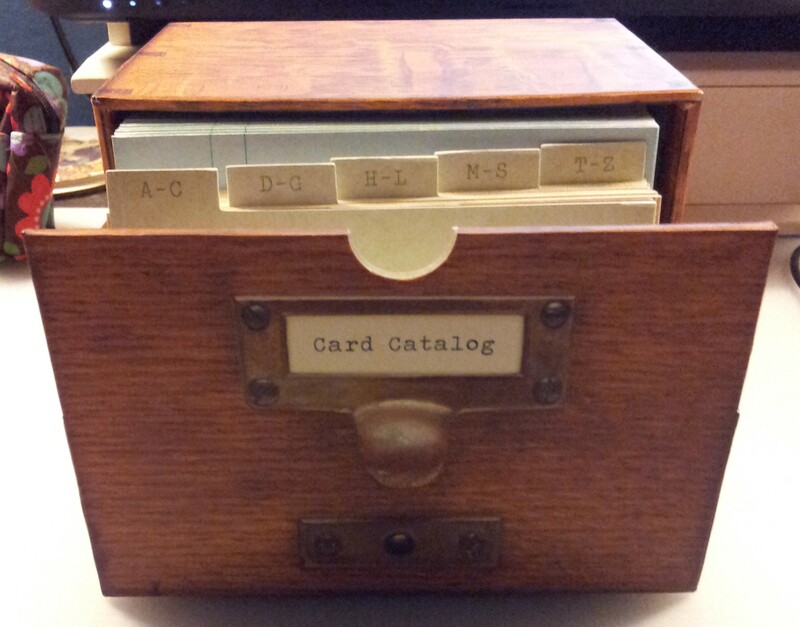 The notecards come in a realistic looking cardboard catalog drawer, with 5 tabbed dividers. It is published by Chronicle Books. Let me explain two things that drew me to this notecard set. In university I worked in the university Library, part time during term and full time in the summer. 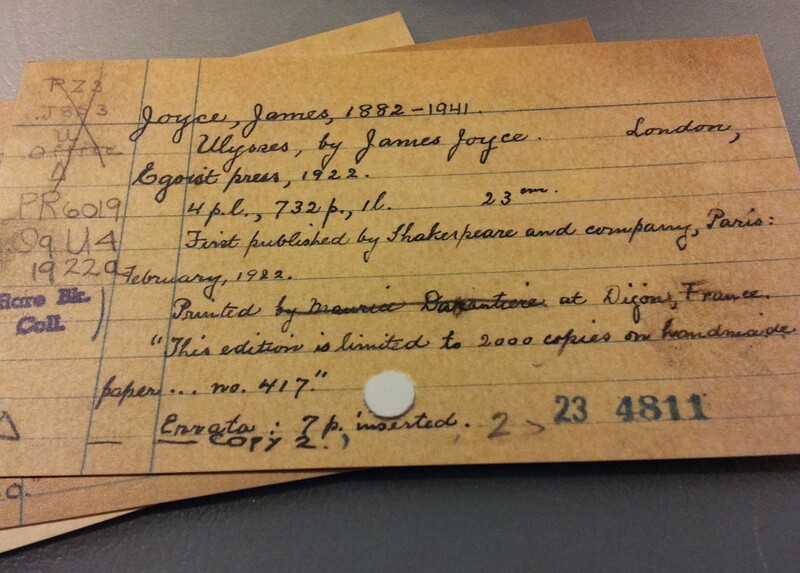 I loved the work and in the first couple of years my job was to type up the card catalogue cards. Yes, actually type them up using an electronic typewriter. I still remember the thrill of completing a set of cards, one each for the author drawer, title drawer and subject drawer. Then removing the long steel rod in the bottom of the drawer, removing a section of cards so the new ones could be inserted, and then running the whole set through with the steel rod once again. 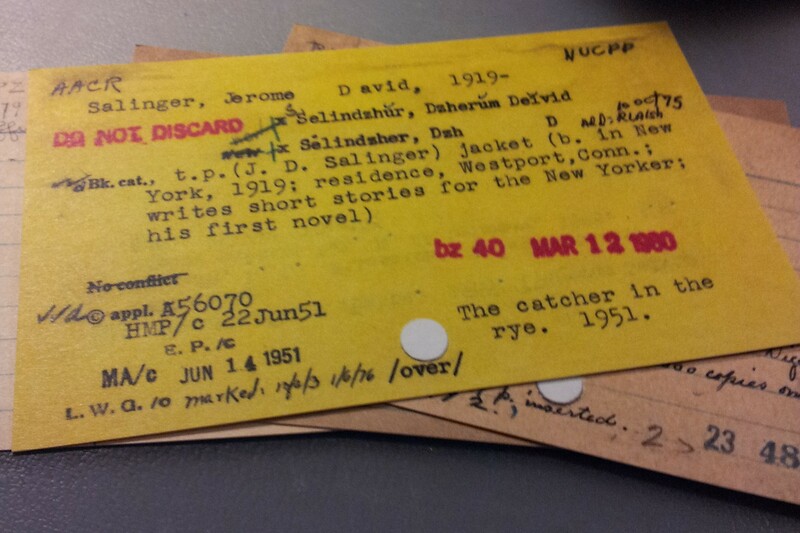 Today we take for granted the digital catalogue we all enjoy at our local library, but there is something so satisfying about the physicality of the card catalogues of 20 years ago. Secondly, I visited the Library of Congress in 2000 and I was forever changed by the experience. The library is like a fairy castle, shimmering white columns and soaring frescoed ceilings. The scope of their holdings is staggering, and I was overwhelmed with emotion as I stood and looked down upon the main reading room. It is an awe-inspiring building, and so it should be, for it houses the largest library in the world. If you want to take an online tour(!) click here. I must admit I do not remember any of the coding for the catalogue cards so I do not know what most of the markings mean. I was struck by the colour; it is the only yellow one in the bunch but google hasn’t been able to help me determine what that colour might mean. And I was struck by the “bz 40 Mar 12 1980” as David Chapman was reading Catcher in the Rye after shooting John Lennon in December of 1980. Chilling. Can you imagine the outrage felt by Emily when her only novel was attributed to Charlotte? Although she may not have lived to see this edition published, as she died in December of 1848. I love this cataloguer’s note detailing the use of the word repudiate and other textual changes, including the addition of a preface, in this particular edition of Hawthorne’s The Scarlet Letter. Impressive; this edition is one of the original 2,000 published by Shakespeare and Company in Paris, 1922. 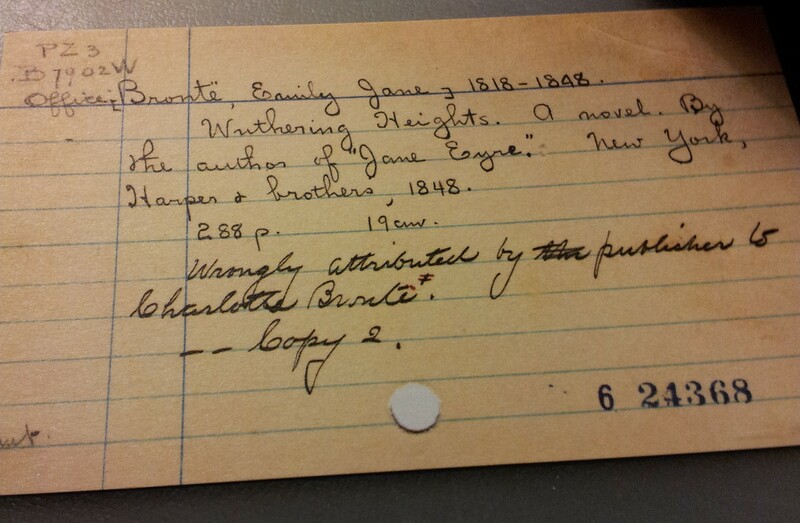 And my favourite; although I’m not sure this card refers to a book at all. It opens with the word Ornament, but it is a Card 2; I wonder what Card 1 said? 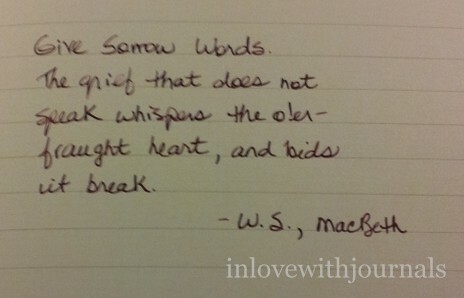 Lovely prose and beautiful handwriting. And if you are wondering the back of each notecard looks like this (on the left) with coordinating blue envelopes. I hope you enjoyed this review of the notecard set and take a look around the Literary Gift Company site for more bookish items! 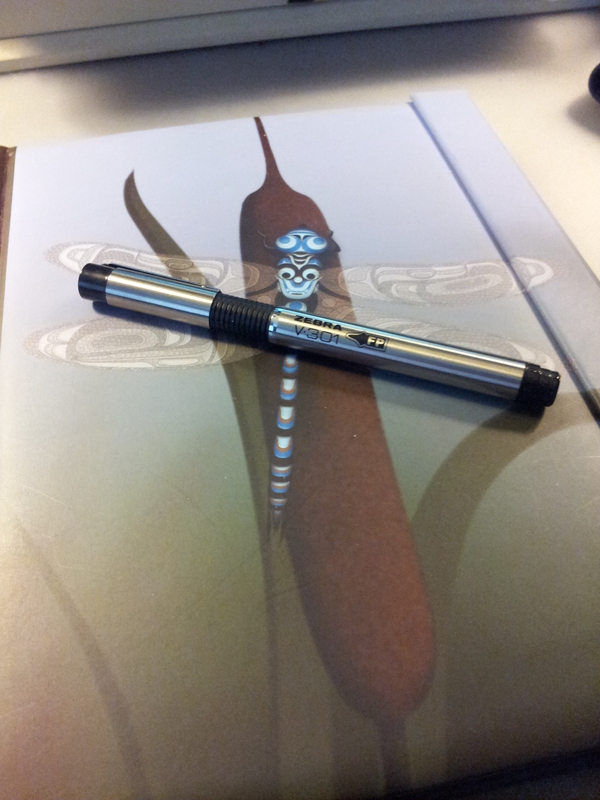 I bought two pens, a pen case and a journal. 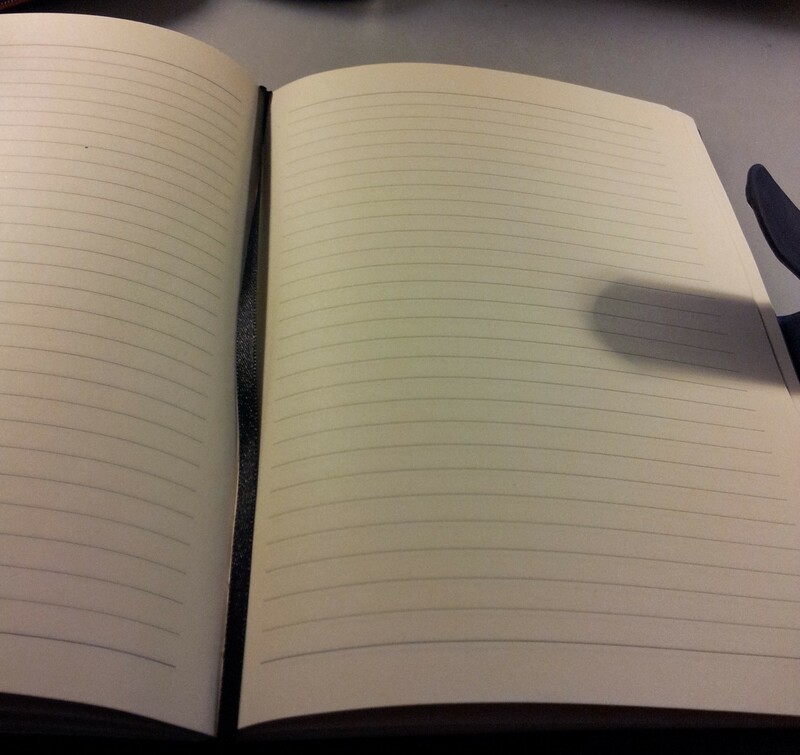 Let’s take a look at the journal first. 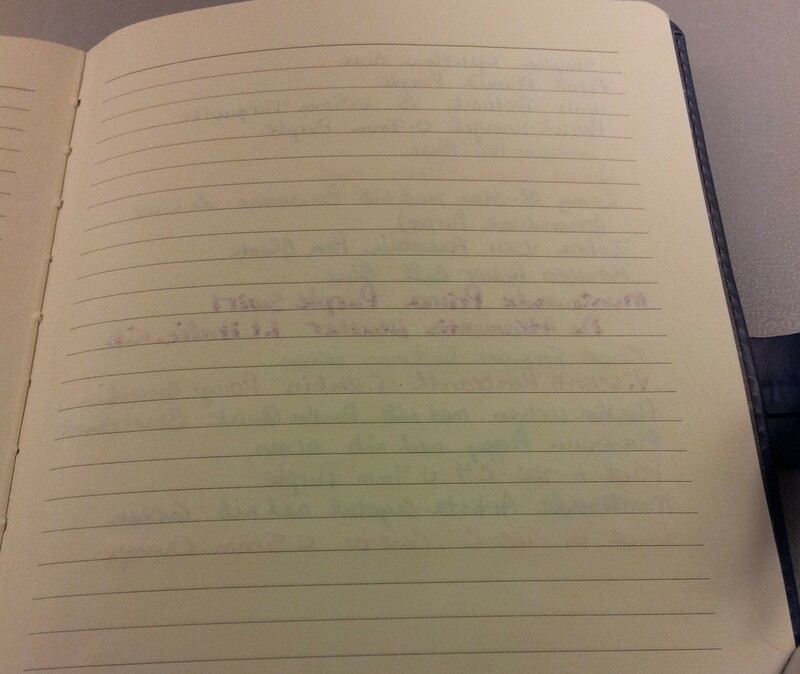 This is the Spring Finale Journal by Andy Everson. 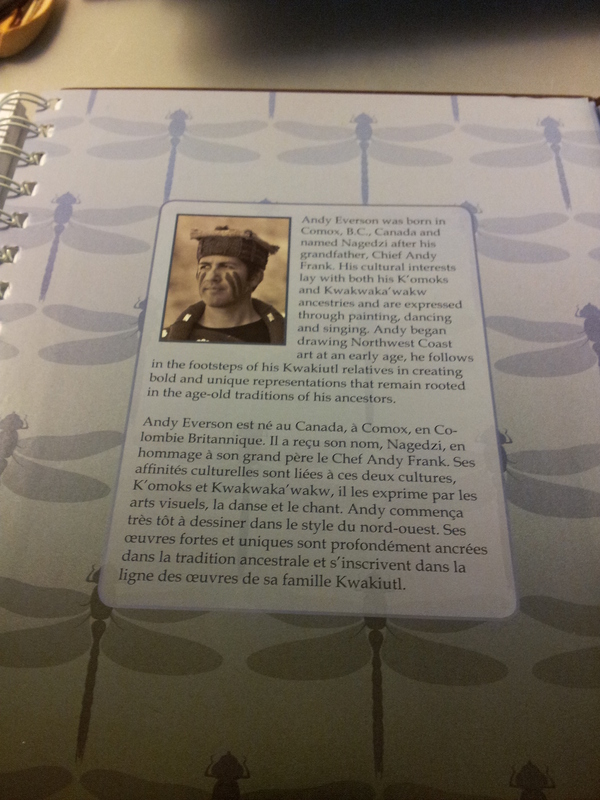 Andy is a First Nation’s Artist and you can learn more about him and his breathtaking art on his webpage. 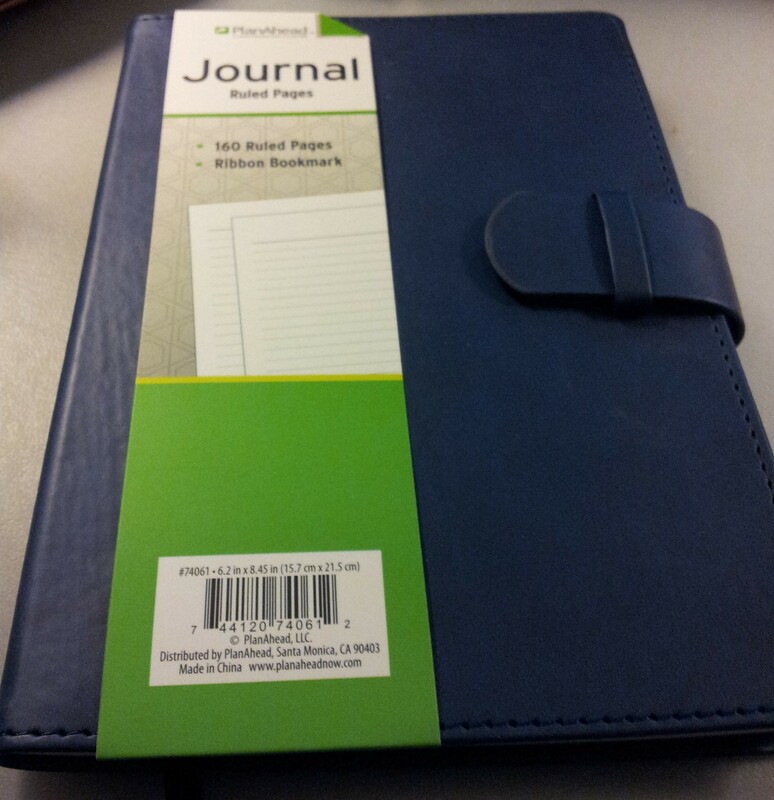 I actually found this journal on my last day, at the airport gift shop. Couldn’t pass it up at $15. 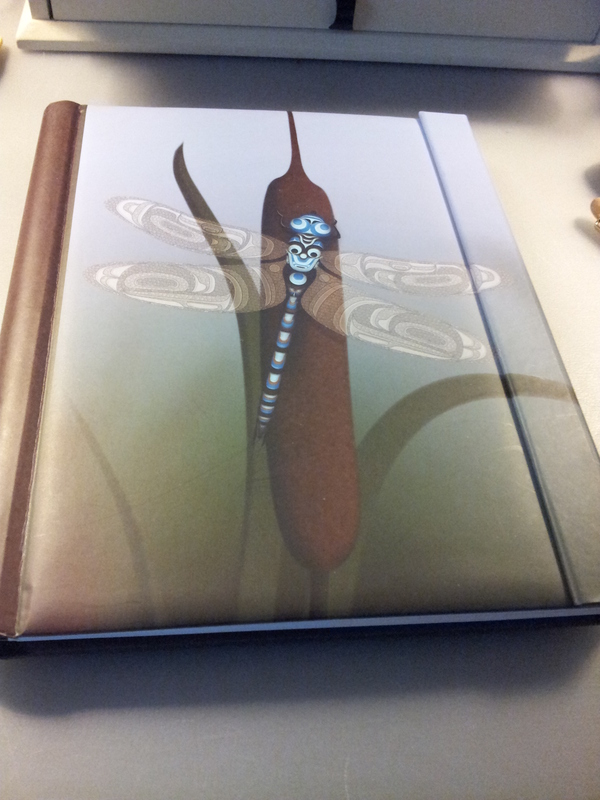 Such beautiful artwork and the journal is well made too. 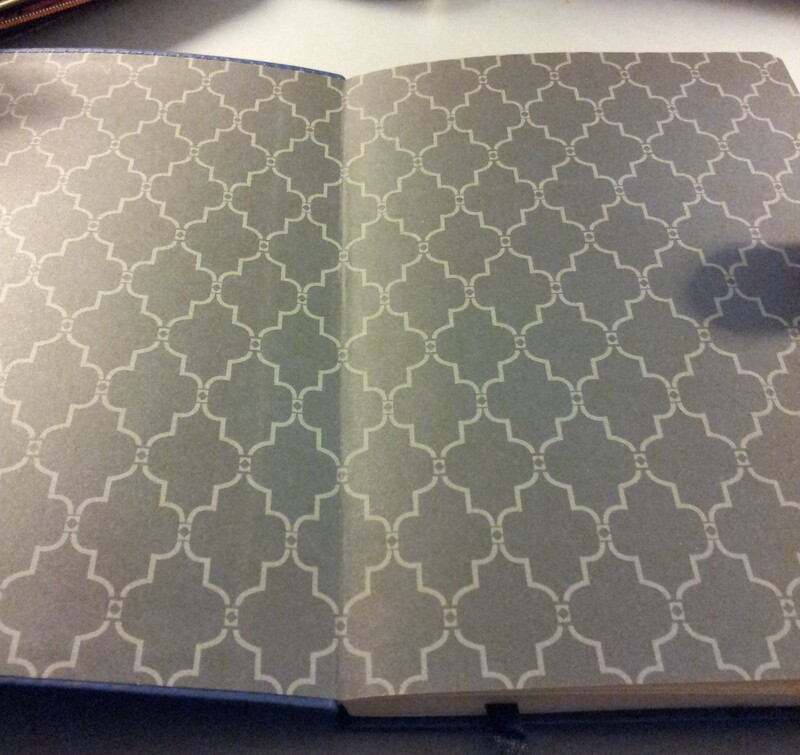 It’s a spiral journal but the spirals are protected by the binding. 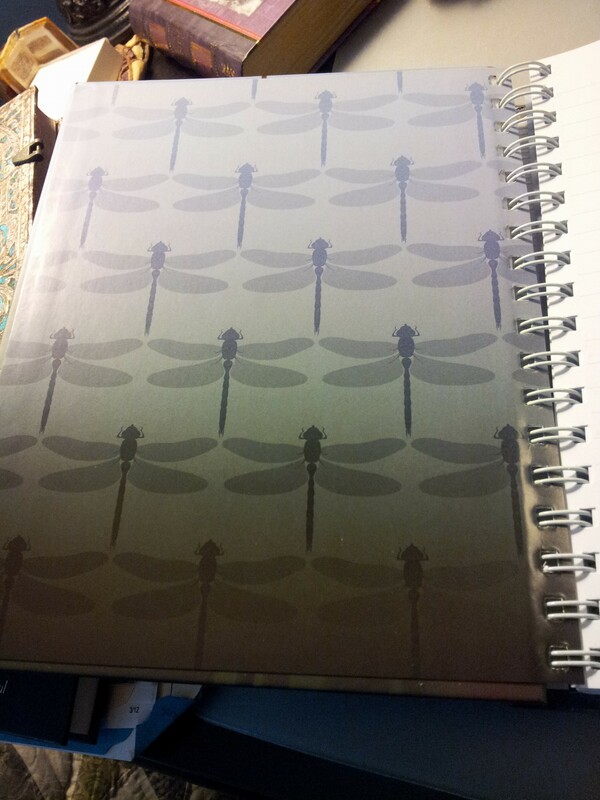 The dragonfly motif is repeated on the inside covers. 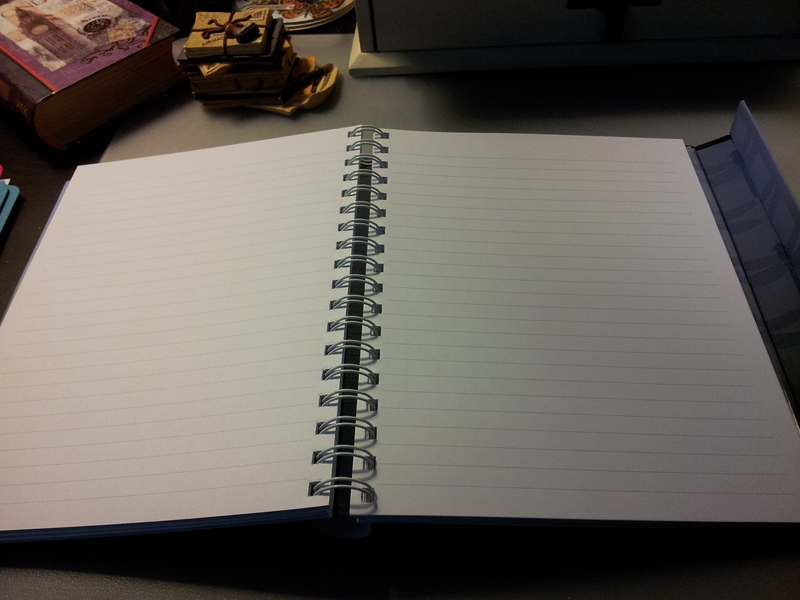 Lined pages. Paper is a medium weight and very creamy feeling. ‘Spring’s Finale’ represents a brief moment in time in which the dragonfly has stopped from its regular activity to rest on a cattail in a swamp. It also represents the crescendo of beauty that is the end of spring. Colours vivid with life have lived on rain and are now rejoicing in the ever-warming sun. ‘Spring’s Finale’ is but a moment in time that encourages you to reflect on the past and prepare for the future. 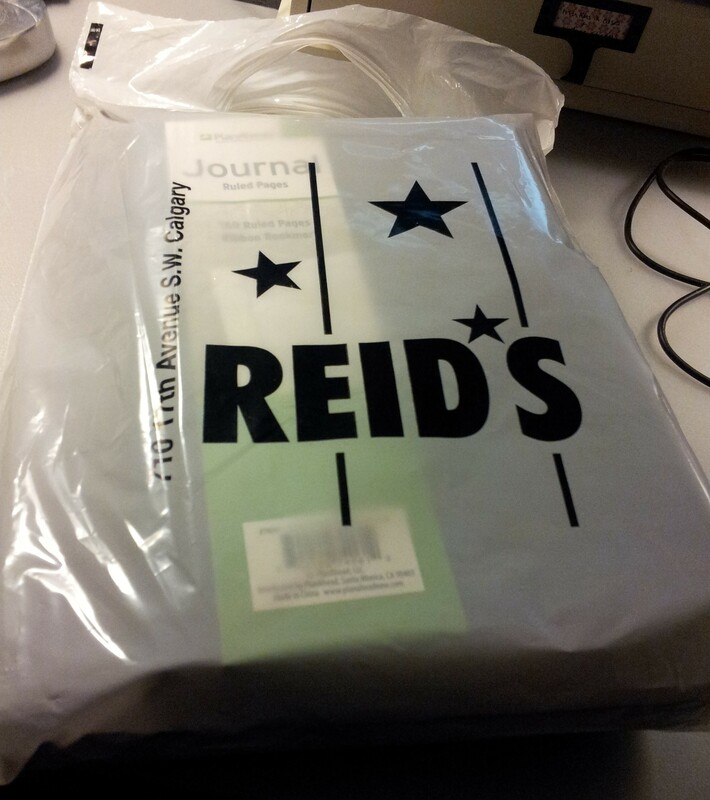 To purchase this and other Andy Everson journals, check out this link. 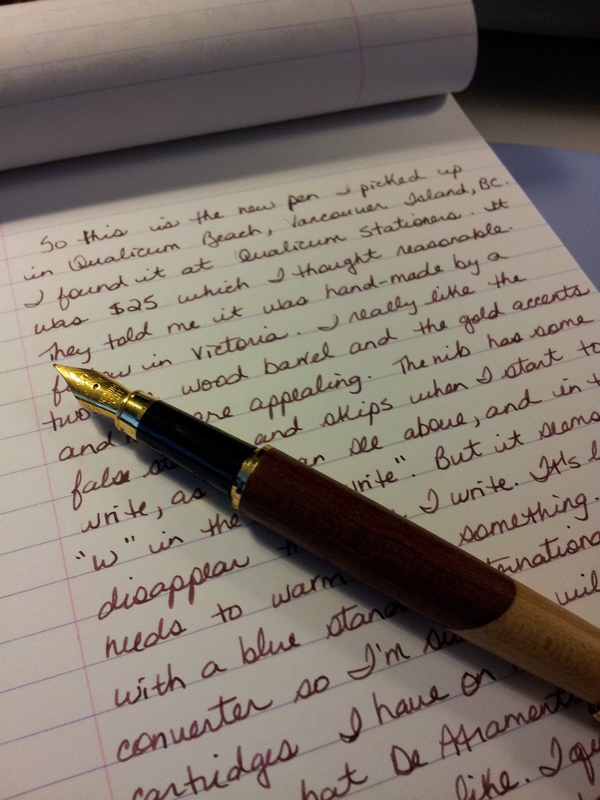 Next up, a wooden fountain pen. I don’t have a lot of information about this pen. 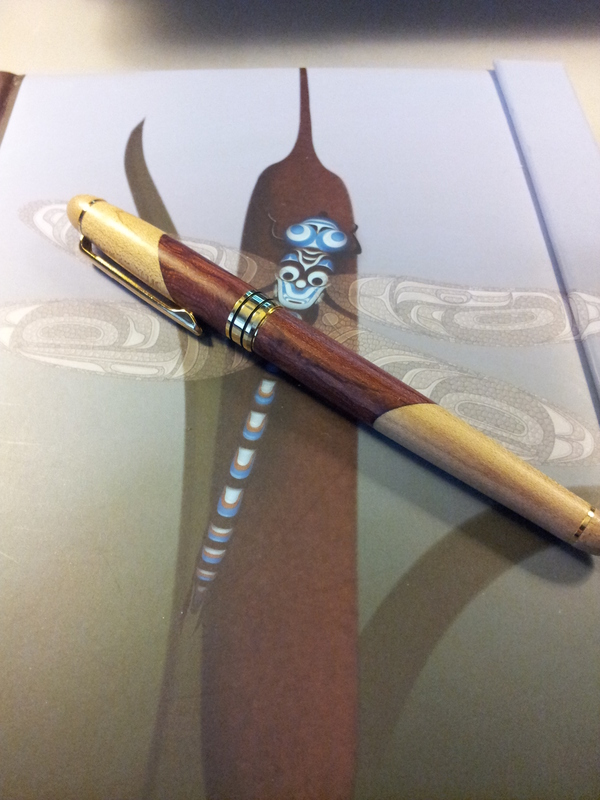 We went to Qualicum Stationers in Qualicum Beach. They had a huge art supply section and framing section, and a small stationery supply section. In their display cabinet at the cash they had some of these wooden fountain pens for $25 each. I was told they are made by a woodworker in Victoria. The barrel and cap are wood, with gold coloured accents. 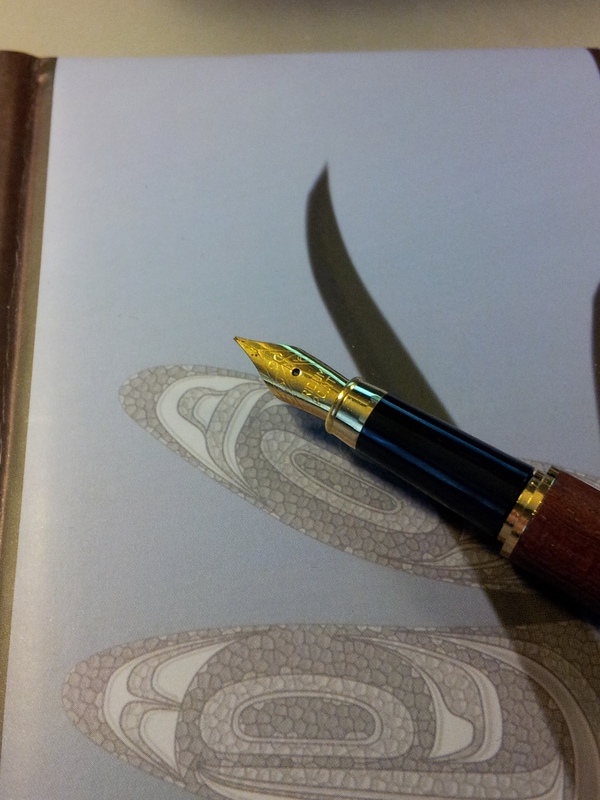 The section is plastic I think, and the medium nib is gold coloured steel. The nib had some false starts and skipped when I started to write, which you can see in the writing sample above a little bit. 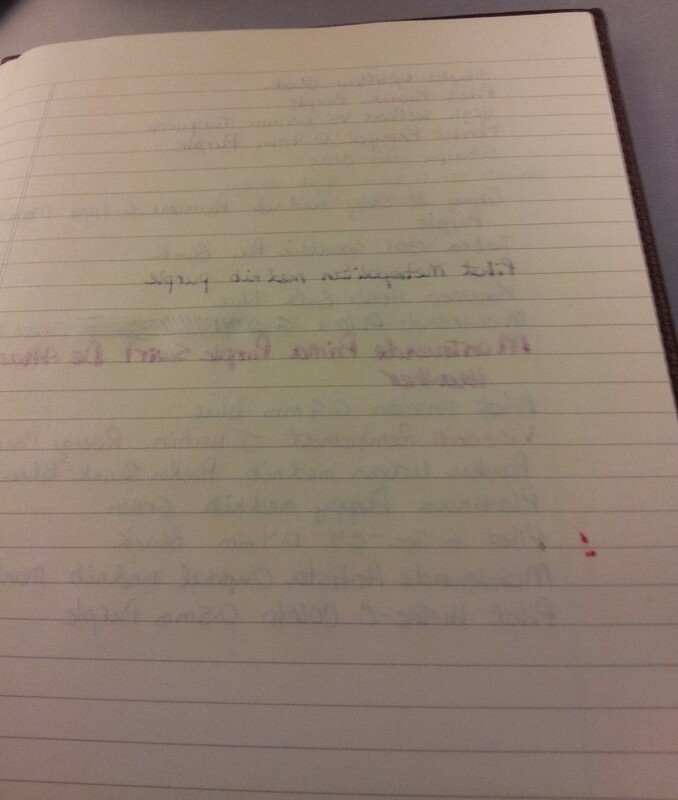 But it disappeared the longer I wrote. It was like it needed to warm up. It came with a standard international size cartridge but I wanted to see what De Atramentis William Shakespeare would look like in it and I really like it. It matches the barrel beautifully, which I like to do. Maybe with more use the nib will even itself out. 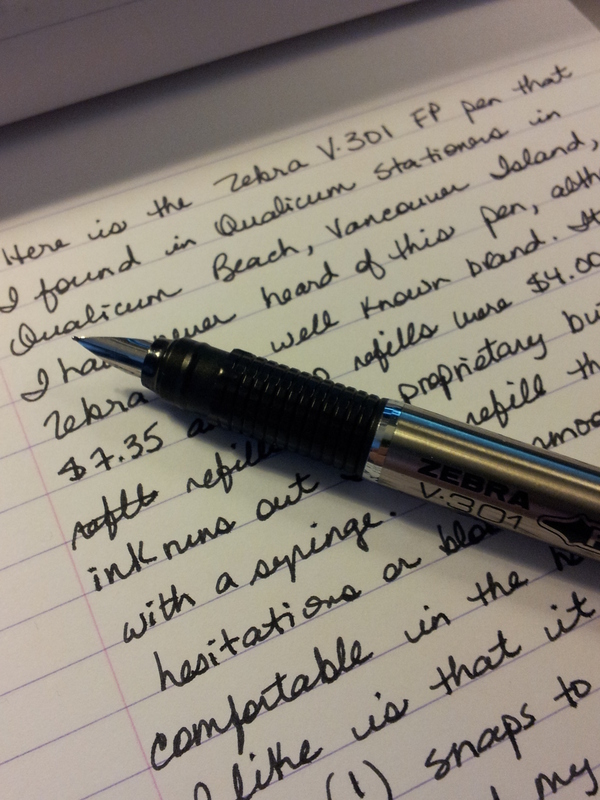 I also picked up this Zebra V-301 Fountain Pen, which I’ve never seen before. The package came with two refill cartridges as well. The pen does not take standard international cartridges but I can always fill them with a needle when they run out. 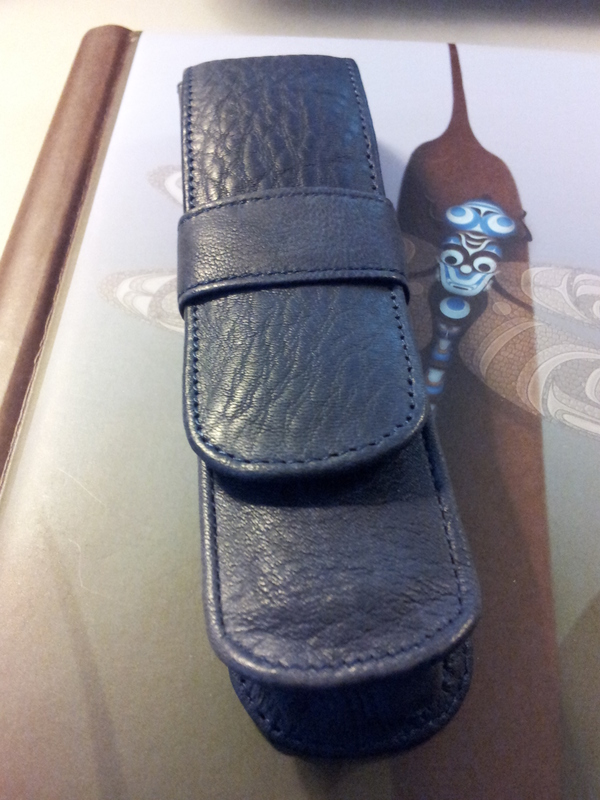 And lastly this blue pen case. I spied the pen case right away in the display case, as I’ve been looking at them online for a long time. Real leather ones start at around $50 which is reasonable when you consider the amount of work that goes into making one. I couldn’t believe it when the salesperson said the price was $14.95. We actually went to this stationery store twice because on our first visit I bought one pen case. I thought about it overnight and took my husband’s advice and went back the next day to buy two more cases. 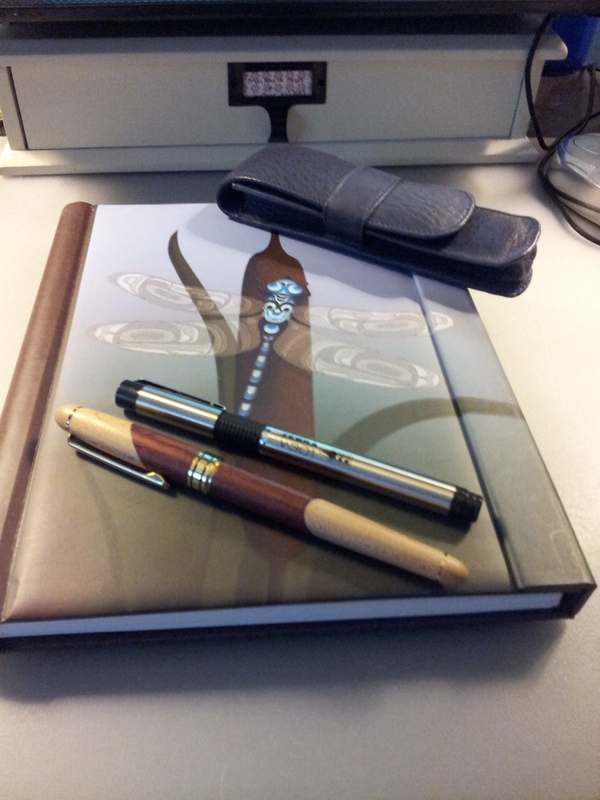 And the interesting thing is, they came from the same fellow who made the fountain pens; his wife is a leather crafter. How cool is that? 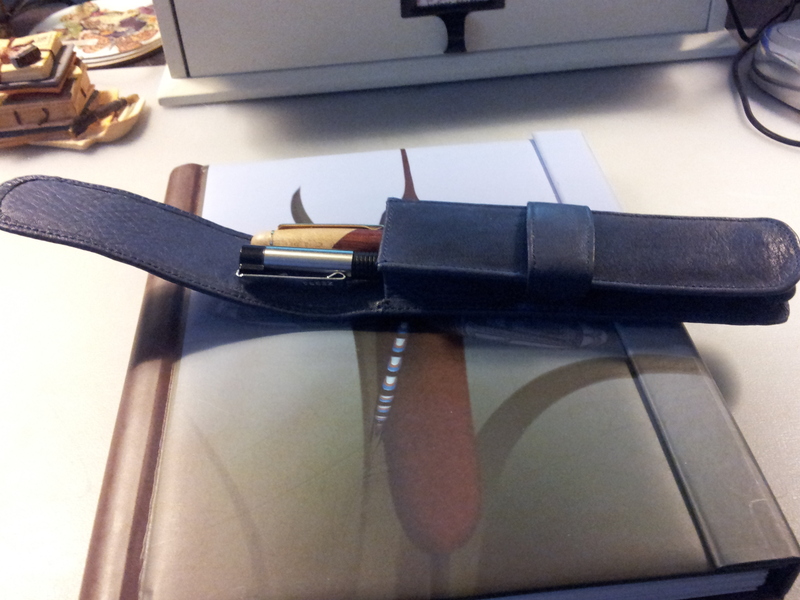 I can fit both pens in comfortably; there is a leather strip down the middle that protects one pen from the other. Unbelievable deal. And such a great colour. So that’s it for my holiday treasures and the memories they bring back. Can’t wait to use them all! I wanted to share a couple of notebooks I picked up recently. 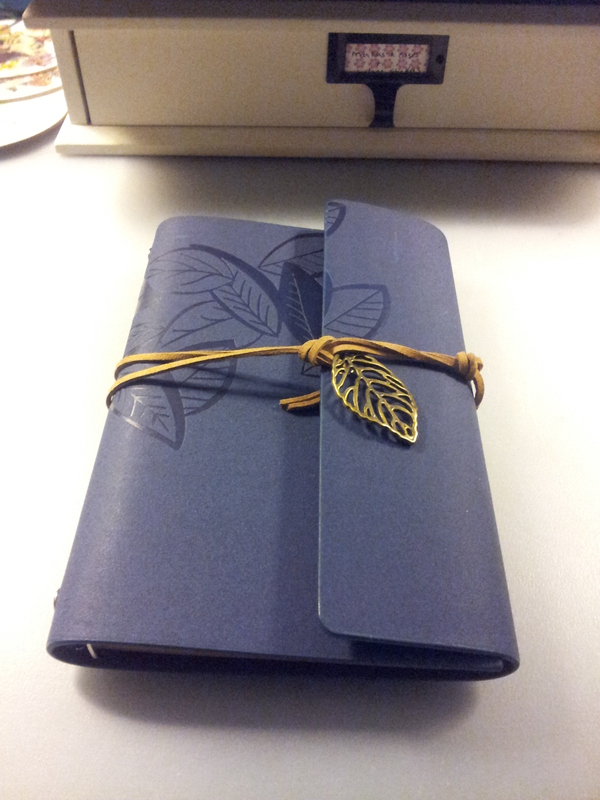 I bought this leaf journal on ebay from a seller called Fairmer. 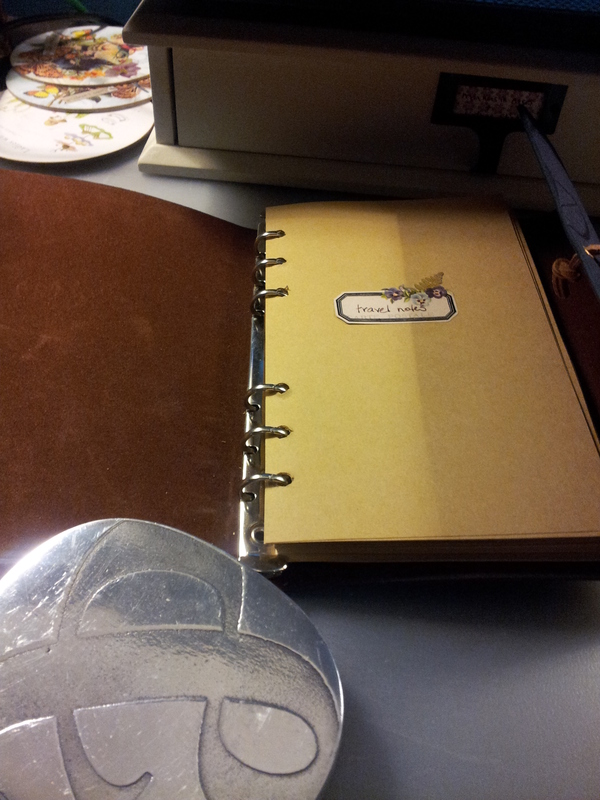 He/she has a large selection of journals and alot of them are ring binders, which is interesting for scrapbooking or adding punched ephemera to your journal. The cover feels like a thick and flexible vinyl, very smooth. 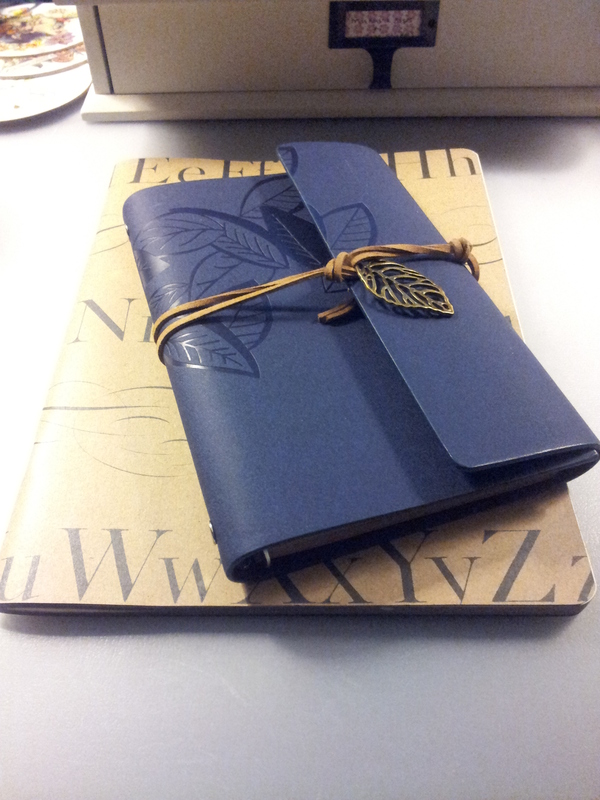 I really enjoy the leaf pattern which is engraved on the cover, and the leaf charm on the leather tie is a lovely touch. The inside is a soft brown suede-like material. 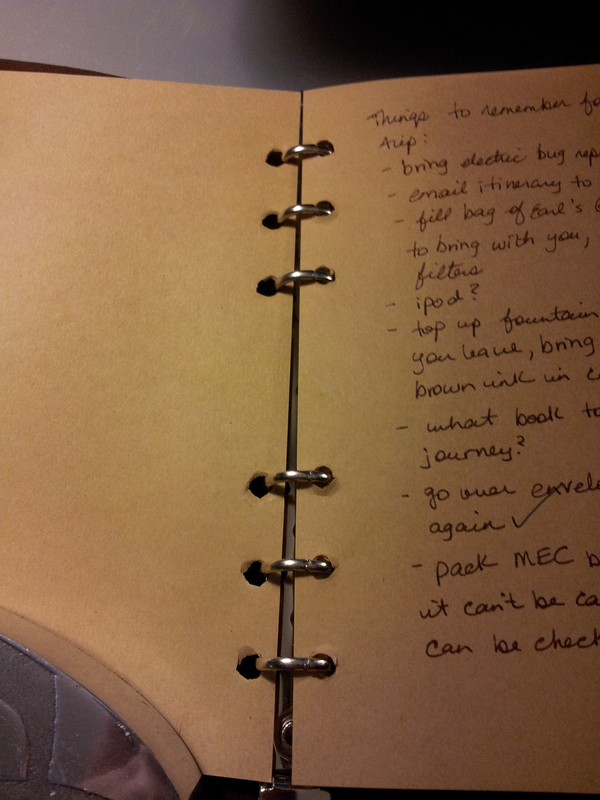 I thought I might take this journal with me on my recent holiday so I put the “travel notes” sticker on the first page. 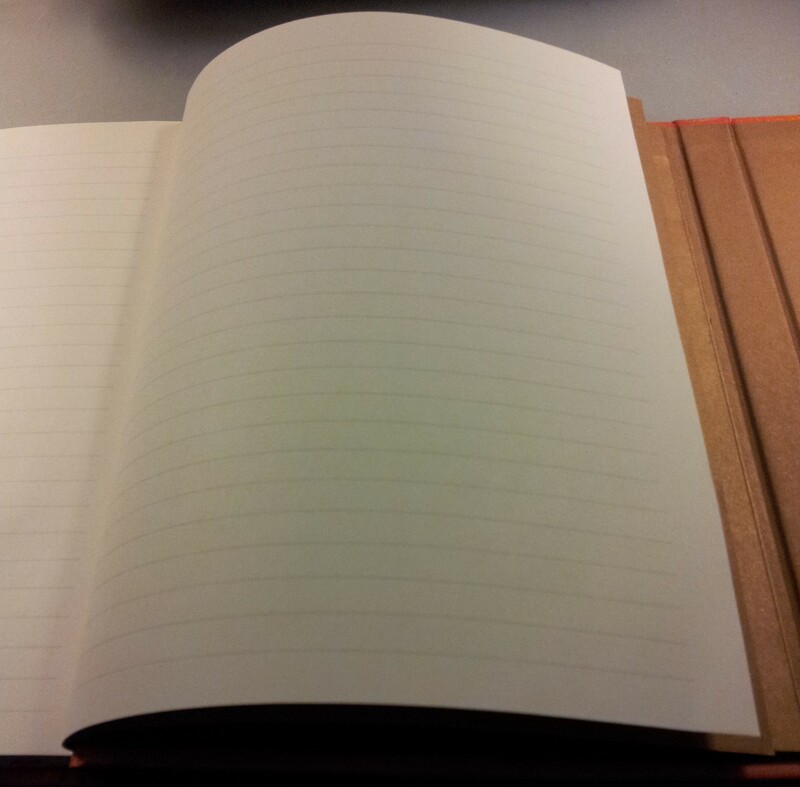 The journal comes packed with the unlined brown paper shown, and there was so much paper I could barely turn the pages. 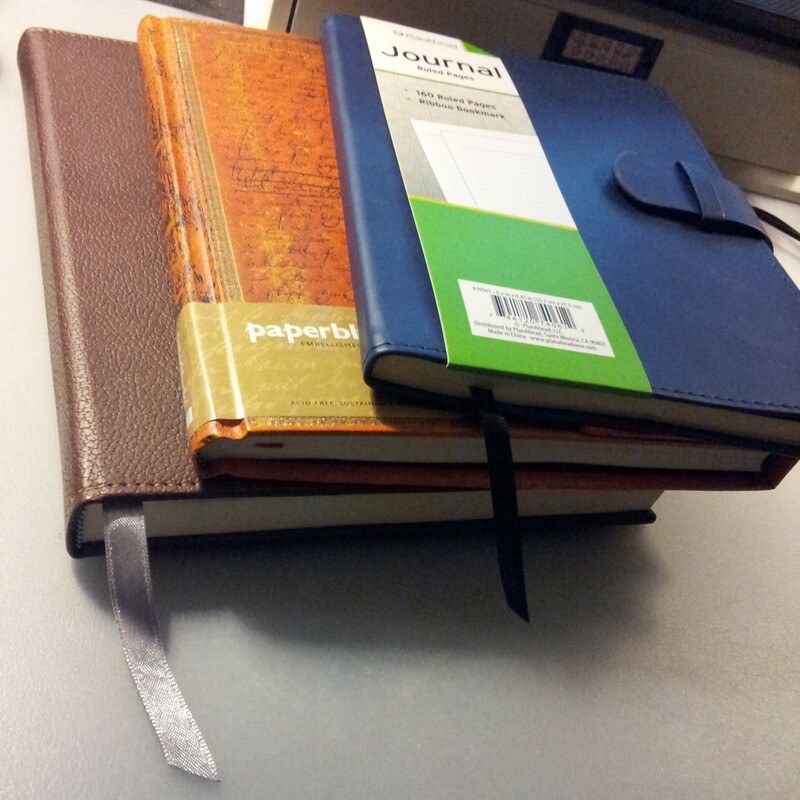 I had to take some out to start writing. 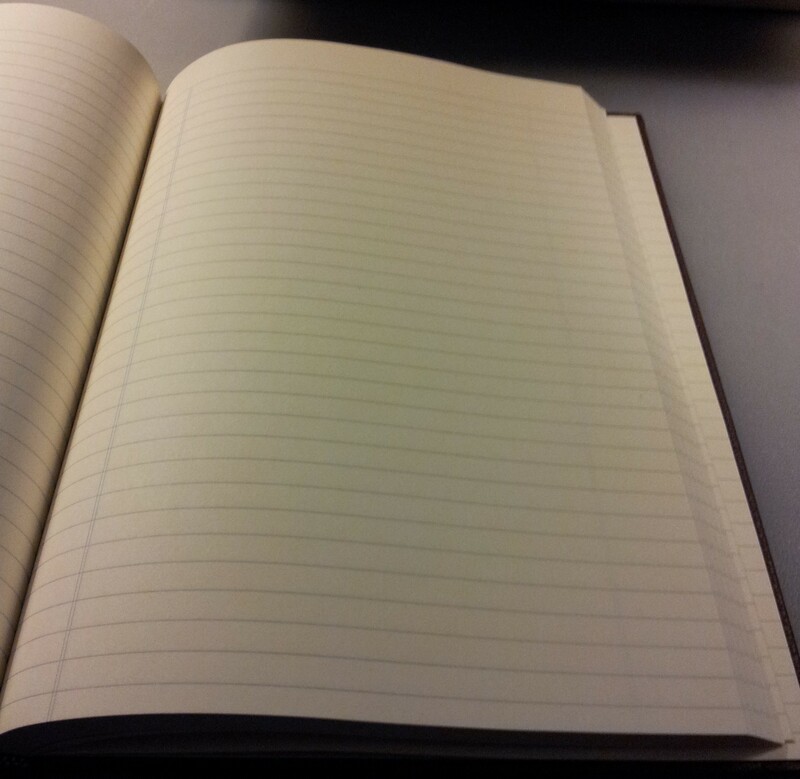 I wouldn’t call myself a list maker, except for when I’m travelling. Things to take with me come to mind at the oddest time so a book like this comes in handy to list everything. 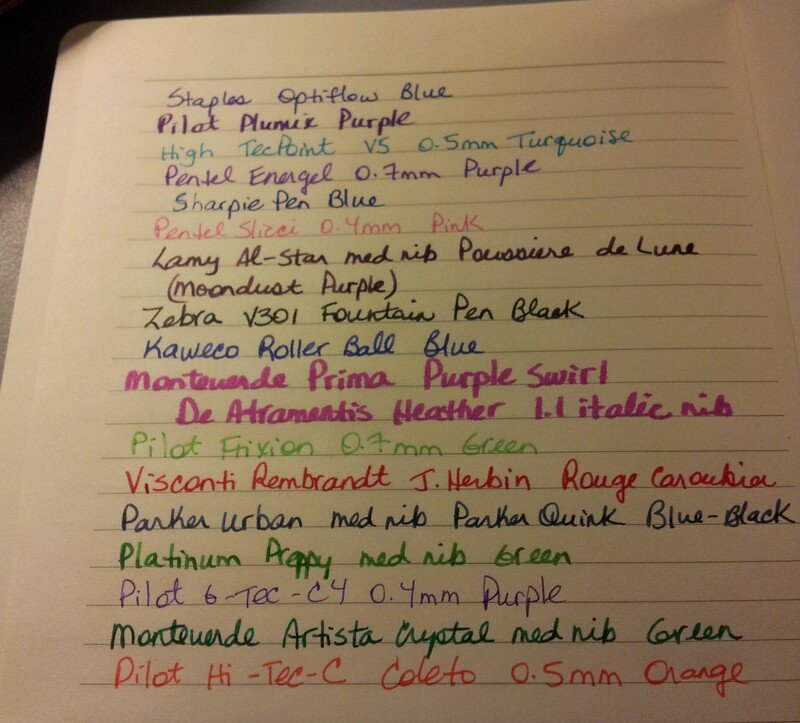 And I used my Lamy Safari with De Atramentis William Shakespeare ink to write the list. 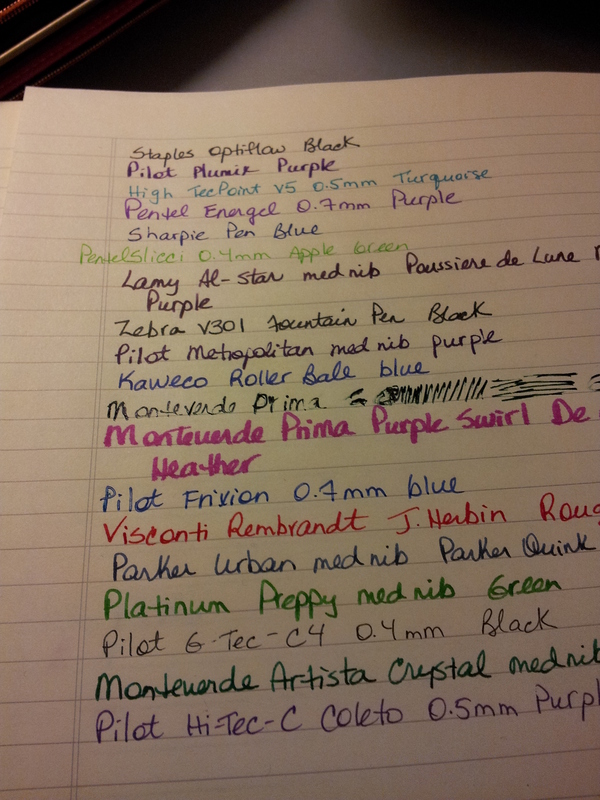 You can see the paper takes fountain pen ink beautifully. 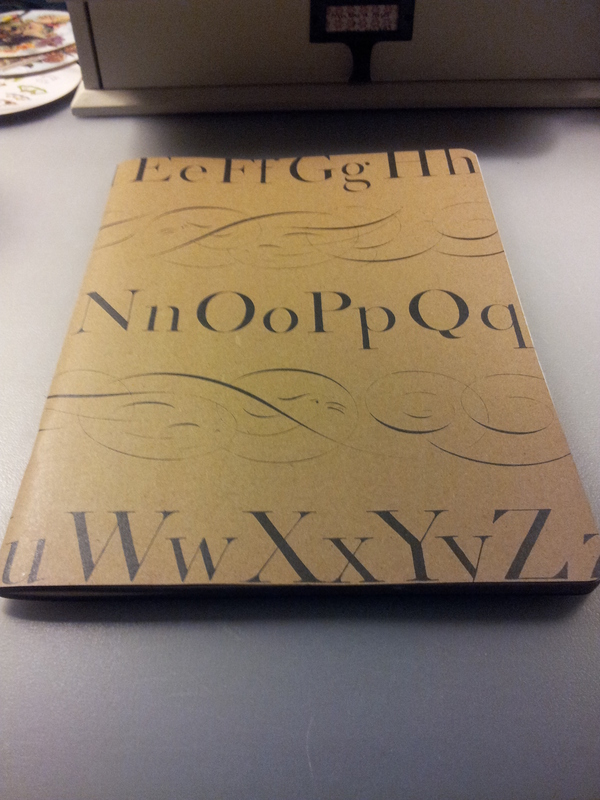 Then I was in Suzie Q Beadworks and picked up this Antique Alphabet Notebook by Fringe Paper Goods. 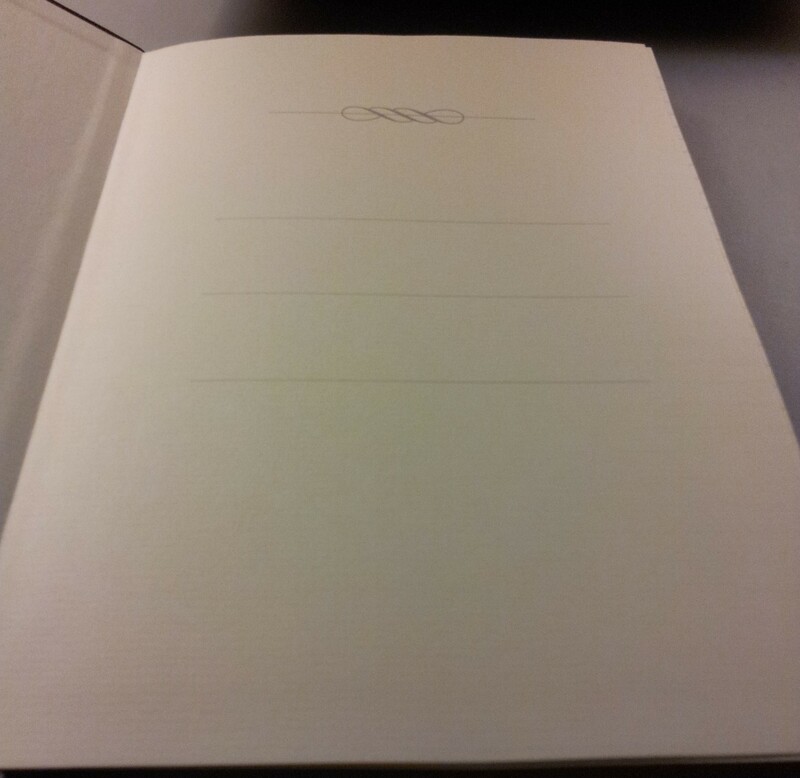 The inside is lined and has a place for the date in the upper right corner of each page. I haven’t done an ink test for this one but will do so when I start to use it regularly. 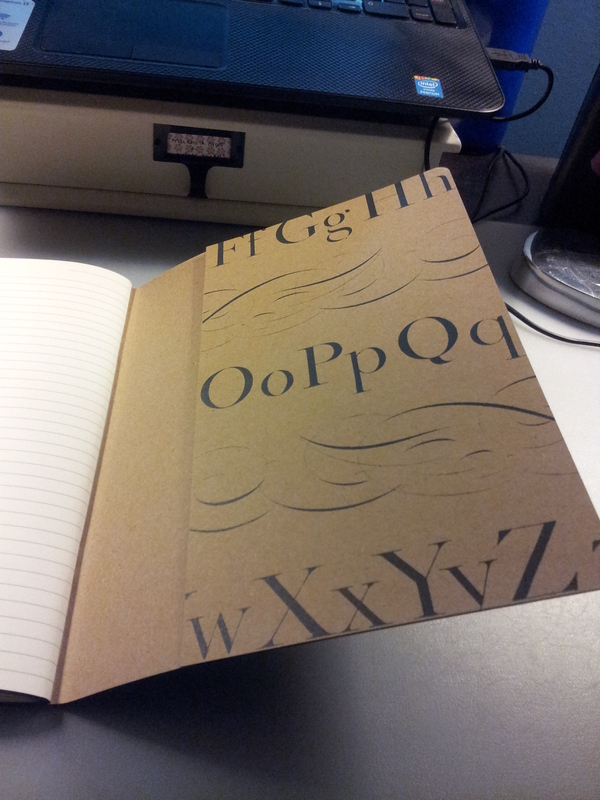 The back cover has a folder to stick loose papers or stickers. And the back cover. 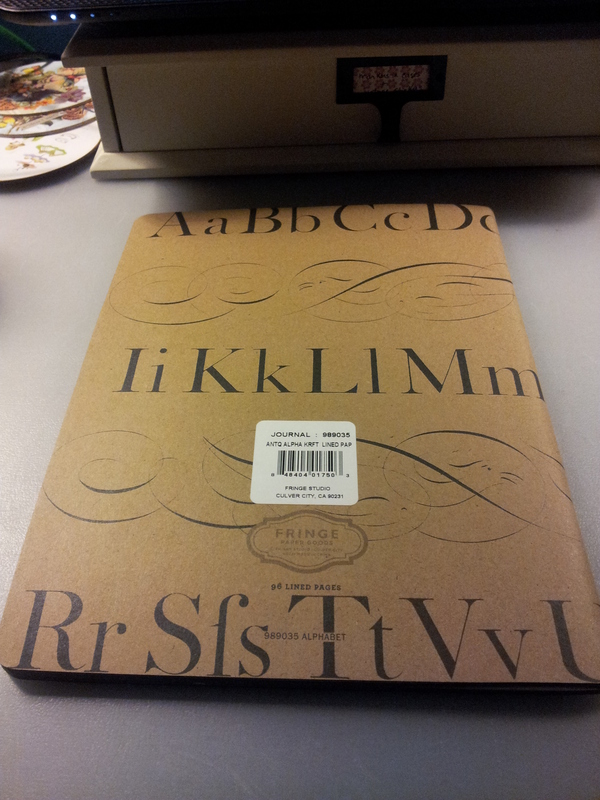 I really enjoy Fringe Paper Goods; they have such a vintage feel and the quality is great.